The bedroom color is so soothing. I've been searching for a cream just like this. What paint color did you use? Can you please tell me where the double gourd lamps are from? They would be perfect for my room.Thank you. what is the ceiling, trim color? I am a little confused, in an article on Houzz about choosing the right white for your walls, this pic was used with the additional info that it is Dover White by Sherwin Williams?! Curtains - Where are these curtains from? I'm wondering specifically about the curtains and the headboard- who makes these fabrics? And...the duvet cover who makes this? The end tables are beautiful...where can I find them or something like them. Postobello, how much is the above pictured nightstand? Where can I find the bed linens? Beautiful!!! What color are the walls? Someone replied MS Vapor but that is a gray blue color. This is more of a straw yellow color. Thanks. I am wondering where the drapes came from. I used Dover white to accent my dining room and I'm looking for ones like that. Thanks! My apologies for the duplicate question. I just saw that you answered the question previously. Duvet Cover - Could you please tell me the name of the material used to make the duvet cover? I love the simplicity of this headboard. Anyone know where I might find one that is similar/same? Restoration Hardware just came out with a line of slip covered beds. Where is the bedding from....specifically the pillows/fabric. this is awesome.this b edroom is good for me and my wife. rug - What is the name brand ?style number and name of the rug ? Love it. What is the specific color in the karastan wool checks? Color of walls ... does the person submitting answer questions? I'm new to this ...Thank you! yes they answer as well as give inputs . Hi razorback, in most cases the designer themselves like Linda Burkhardt, will answer questions regarding a particular room. Other houzz members may also chime in if a wall color, furniture piece or accessory looks familiar. If you admire a room always click the "More Info" area to see if your inquiry may have already been answered or an item has been identified with a green tag. Does anyone know where I can find the floor lamp or something similar? I would love to see the tripod/shelf-style in my bedroom. Try one of the home improvement stores. They carry nice lamps and I've gotten similar in the past. Would love to know size of nightstands and where they can be purchased. The Avalon Nightstand is 36"W x 17"D x 34.25"H. However they are customizable as are all of Postobello's designs. You can purchase directly from us. Please email me at jonny@postobello.com. Thanks! Hi, would someone tell me what type of window treatment (besides the drapes) is used and where it could be from? It looks like sheer linen-like accordion maybe? Please share the manufacturer of the double gourd lamps. Are they Robert Abby? What particular fabric was used for the drapes? What store are the curtains from? Which product specifically? Thank you! Such an elegant and peaceful look... - What fabric was used to make the duvet cover? Is it linen? Thank you for responding so quickly. Does the linen show much more wrinkling than a fine cotton would? I hope I am not imposing on you, but I would also love to know the make and colour (white? off white?) of the duvet, bedskirt and drapery fabrics, and also the make and pattern of the fabric on the Eurocushions. Is the drapery also linen? I was debating about whether to use sheers or wooden blinds behind my drapes, but this picture is making me consider wood shutters now. Your taste is impeccable....elegant and and classy, and quietly luxurious. Perfection. I love this room! Where are the large white table lamps from? Thank you! Can you tell me where you sourced the drapes in this arrangement? What is the color of the trim and the color of the ceiling? Thank you! Benjamin Moore's line of shades of white is just beautiful! where to buy the bedding? - where to buy the bedding ? Can I order the bedding through you? Do you have contact information? I would like information on the custom bedding as well. It's beautiful and doesn't appear to be heavy weight like some comforters are. What is the paint color on the walls and trim? What about the ceiling color? Bedding - Can you tell me where the bedding came from. Love the simplicity ! Where can I get the bedside lamps? Can you tell me where the drapery fabric is from and what color it is? Where can I find the night stands? what kind of carpet is this? what color carpet is this? where did you get the long curtain rod? - I'm hoping the curtain rod behind the bed that has 1 support bar is longer than 10'. Where did you get it? HI~May i wondering which collection from restoration hardware ? what is the name of the colour on the wall? What color are the Silouhette blinds in the windows? - Was wondering what color the Hunter Douglas blinds are? 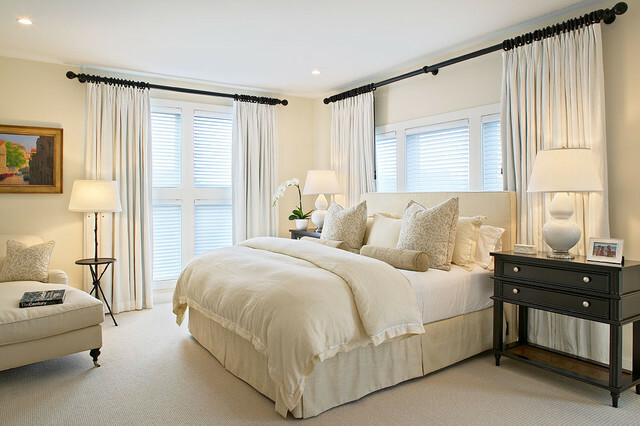 The layering of light colors in this bedroom is very soothing so I think the blind color is important as well. Where are the curtain rods from and how wide are they? what color paint did you use for the rod? This is just a serene room. I love everything about it. Can anyone pls tell me the color and make of the carpet? Do you know the color? Does anyone know who makes the lamps? I know I have seen them before, but can't remember where. Have you looked at Kirsch or Select? It looks like a 1 3/8" rod with Euro brackets. Where is the headboard from? Love the simplicity of it. You can find pieces similar to this in Pottery Barn. Upholstered headboards are back in fashion again! I remember having one in the late 80s/early 90s, though be careful about putting your head against it. The fabric does absorb oils/lotions from the hair. Don't you think it looks nice in this picture? It might be important to note how you can still see much of the drape going to the floor, behind the nightstand. So it looks intentional, not completely blocked. Love the chaise, looking for a small one. Who makes this one? Carpet - Can you please tell me the name of this carpet? also about paint - I love the linen white. We have purchased a Chicago apartment with little natural light. My thought is to paint linen white walls, trim and ceiling as well as cabinetry. Wondering if high gloss paint would help brighten the space? Otherwise what would you recommend? We have lots of artwork and plan to add beautiful lighting. Going for a very elegant, neoclassic look. Thanks so much for your thoughts! Thank you - Thanks for telling me that the paint is Benjamin Moore, Linen White. Is there a paint coat number? What other furniture is in this bedroom? Dressers and chest?? - I love the night tables and am wondering what other furniture pieces are in this room. Specifically, dressers and chests? Same Drexel collection as the night stand or something else that is complimentary. Thanks so much! Great job on this room!!! Windows - Which Pella windows were selected and do they open? All The Anderson Awning Windows Open. Read the entire Q&A - You are a Saint for answering the same questions a dozen times, I lost count on how many times you were asked about the bedding. I do understand the interest however. This room is gorgeous! Drapes - What is the material of the drapes? Thank you! Very interesting lamp/accent table. Where could I get one? Can you tell me the featured Karastan carpet? What is the treatment on the window? Can they be room darkening? What is the diameter of the curtain rod? LOVE the lamps!! Can you please tell me where I can purchase them? style cabinets - Hi, Linda. Very beautiful bedroom. And what kind of cabinets in this room? or dressing room here? Carpet? - What type and color carpet is this? Comforter - Could you tell me where you got the comforter? what would you name the pleat they used for the hanging drapes? Anyone know the cell size of the blinds in the window? Hi. Love the comforter/duvet...what is the fabric? Are the curtains white or cream? Is the bedding a pale yellow/ivory? Can someone please share the height of the double gourd lamps....22 or 31 inches? Thanks! that's a really good question.. I will have to get back with you! Lamp - Can you tell me where the floor lamp with table is from? It is perfect for next to a chair. Thanks! are the curtains made in Sunbrella linen natural 8304? beautiful! - I'm a fan of BM white linen and I am curious about the make and color of the carpet. My current challenge is finding a good carpet/paint combination. Thank you. Curtain rod? - Hi, can you share who makes the curtain rod? Lovely room! Source of floor lamp? - That would suit my needs wonderfully! Would you please share the source of that floor lamp? Thank you very much. Finish on trim paint? - Thank you for sharing the paint colors. What is the paint finish on the trim? You created such a beautiful room! Thanks for posting it. Carpet - Lovely room! I would appreciate the manufacturer, style and color of the beautiful Berber carpet. Thanks! Bed in front of window? - I like that you placed the bed in front of a window. It is rarely seen. Ours is in front of a window. What are the dimensions of this bed? And the width of the window? Carpet - Any idea what kind of carpet and color? Can you please tell me where the painting and rug is from? Annie K - Where are the night stands from? 4. This beautiful bedroom is a great example of all-white done right. A mix of subtle patterns and textures keeps the eye entertained, but is still soothing and relaxing. Readers also loved the bedding — don't you just want to snuggle up under that fluffy duvet? Drapery hanging to the sides of windows provides the bed a strong sense of place without sacrificing light from outdoors. This neutral room is the kind of place we could curl up and fall right to sleep in. The tones are so soothing. We love how this designer chose to draw the eye away from all those neutrals with a punch of dark wood. The contrast between the curtain rods and the curtains shows them both off. Bedding. Bed linens made from pure linen feel soft and natural. The more they are washed, the more organic and soft they appear and feel — the natural wrinkled look is part of the charm. While linen shrinks little when it's tumble dried, excessive drying is not advised. The fabric works well year-round, keeping us warm in winter and cool in summer.